Supports sending everything on your phone screen - including apps, streaming video, live video and more - to your HDMI-equipped TV, projector in up to 1080p HD, through Wireless connection, under the popular standards Miracast/WiDI(Support Android and Windows8.1/10), Airplay(Support iOS and OS X ),Google home Cast and DLNA to enjoy excellent multi-display sharing. 【Support Netflix,IMDb,Spotify etc Need Google Home APP】Mirroring Dongle supports mirror online and local content.What's more，Android device can also mirror any paid and encrypted videos and APPs based on Google service like Netflix,YouTube,HBO,Amazon Video, Hulu,ESPN,Google Play,IMDb,Spotify,CBS,SHOWTIME etc thorough Chrome and Google home Cast【Apple system does not support Google service agreement and therefore cannot use Google-based paid video】. 【EASY TO USE&PLUG AND PLAY】: Only 3 steps to enjoy media on large screen: Plug->Connect->Mirroring via Miracast/ DLAN /Airplay and Chrome or Google Home cast. Connection way are different depending on your phone mode. Note: Please set the TV signal source to the connected HDMI port when using. And pull out the USB power when not using. 【HIGH LEVEL of SECURITY & UPGRADE AUTOMATICALLY】: HDMI Dongle meets stringent CE & ROSH certification requirements for product safety.And it will upgrade automatically when there is a new version on the dongle server. 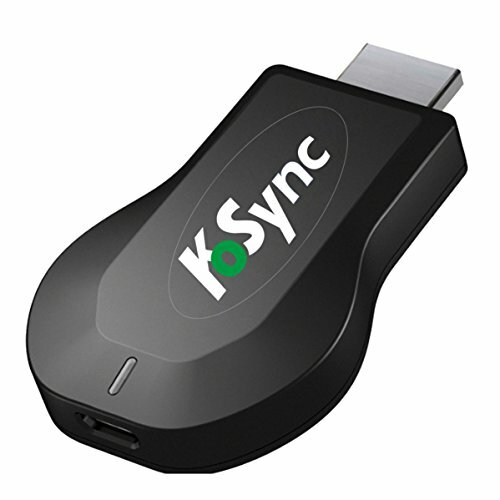 If you have any questions about this product by KOSYNC, contact us by completing and submitting the form below. If you are looking for a specif part number, please include it with your message.